. : Farm Forest Line - Farm forestry research:. Farm Forestry research involves the systematic enquiry and investigation of facts and principles related to growing trees on farms, and the marketing of farm forestry products and services. Despite many years of research undertaken in native forests and conventional timber plantations across Australia, there remains a great deal of uncertainty about the growth and performance of many tree species, especially where they are grown in new areas or in new ways. Consequently, farmers must always be cautious when considering results or the conclusions based on research done in other regions or under different management regimes. Australia is fortunate to have a number of national and regional research organisations working on projects relevant to farm forestry and revegetation. 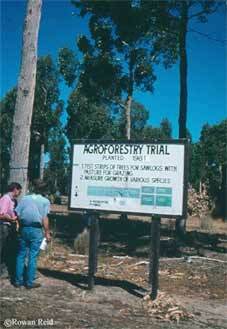 Some, such as the Joint Venture Agroforestry Program, focus exclusively on farm forestry research. Others of relevance to farm forestry include those working on land degradation, tree and forest products, and agricultural systems. The timber industry is also involved in developing or improving manufacturing and marketing opportunities, and forestry companies and nurseries are continually improving their operational efficiency and identifying improved methods and genetic material. Whilst formal research is important in ensuring there is a scientific basis underpinning farm forestry development, on-farm research and adaptation is now widely recognized as also fundamental in furthering knowledge and farmer confidence. Farmer involvement in research and monitoring also helps in highlighting research needs.